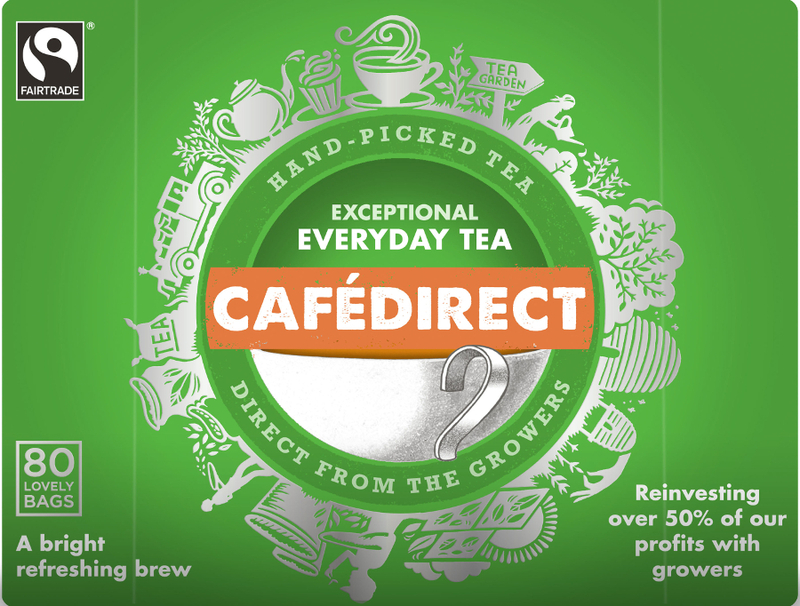 Cafedirect Everyday Tea is a high quality, full-flavoured black tea blended to give a traditional English taste. Each box contains 80 tea bags packed in 100% recyclable packaging. About the Producers: Tea blending, like growing, is an art, and we are proud of the example you have in your hands. This bright refreshing blend is a careful balance of fine teas from Kenya, Tanzania and Uganda.We go to both Tanzania and Uganda to find fine teas with body and a distinctive rosy colour. We then blend them with Kenyan leaves, specially chosen for their fresh, delicate flavours. Great tea is not a simple matter. It requires expertise all the way from the field to the cup, which is why we continually invest in the businesses and communities of our grower partners. By training them in all aspects of production and tasting, they have the know-how to ensure our tea is always tip-top. 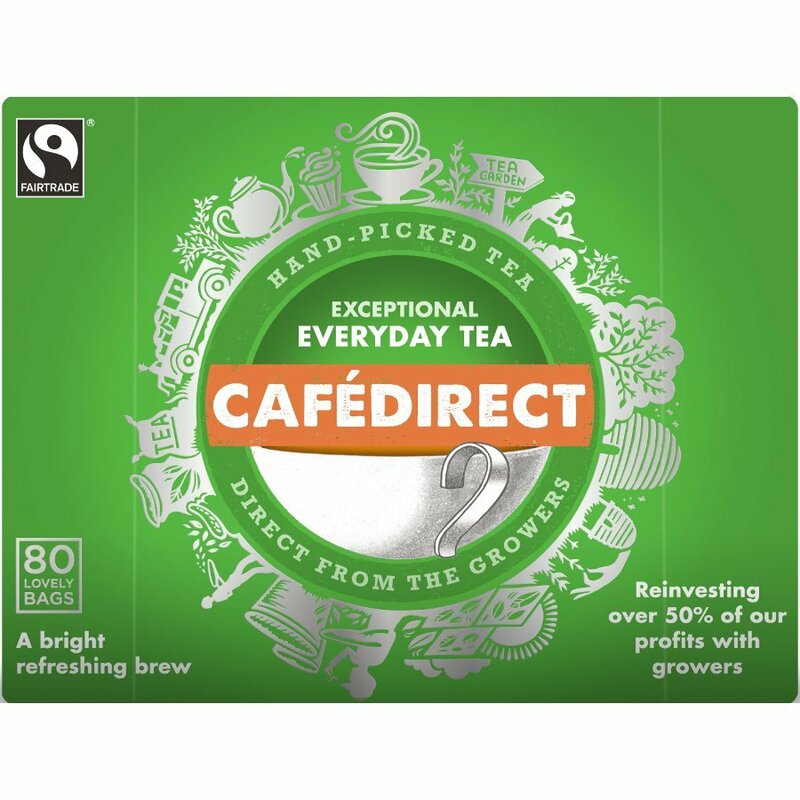 About the Supplier: Everything Cafédirect buys is Fairtrade - that means growers get a guaranteed minimum price for their tea. And Cafédirect helps growers and their communities in other ways too. Two growers sit on the board and most grower organisations have a shareholding in the company. Origin: A blended tea sourced from fair trade suppliers in Tanzania, Kenya and Uganda. Imported and produced by Cafedirect. The Cafedirect Everyday Tea - 80 Bags product ethics are indicated below. To learn more about these product ethics and to see related products, follow the links below. Like Cafedirect and this is the easiest place for us to get them. We have only just started using this at Church, but people seem happy with it. Q: I have recently discovered that quite a number of tea bags are bleached. Firstly, please can you tell me whether café direct do this with their tea products (in particular the everyday tea) and secondly, if so, why is this done and what is used to do this? A: All Cafe Direct teabags are packed in bleached paper. The bleaching process is chlorine free. The process used is known as stage 3 oxygen bleaching. It is claimed that the environmental load of bleaching is lower than the process used to remove impurities of unbleached paper. Without this process, the bag would have a distinct yellow colour. 11 out of 11 found this question and answer helpful. Q: I've had this tea for some years and the tea bags have always been round and foil packed as per the description. I've just received my latest order and the tea bags are square and not foil wrapped. Prefer them the old way. Is this a permanent change? If so the description needs updating.